If there is one dessert that screams decadent, it’s cheesecake. It’s also one of those desserts that when the craving strikes, nothing else quite hits the spot. That’s why today’s recipe is devoted to creating this perfectly creamy treat. Preheat the oven to 375F. 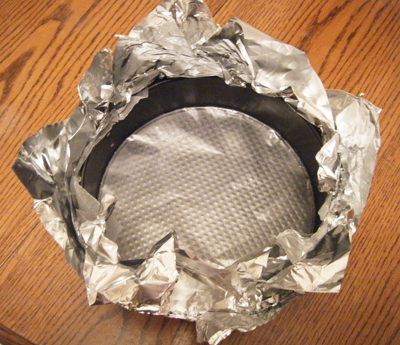 Line the bottom of a 9″ springform pan with foil, tucking the foil tightly underneath the pan bottom. Assemble the pan, then unfold the foil from the bottom around the side of the pan (a quick look at what the end product should look like. It’s to prevent leaking during the water bath). Brush the bottom and sides of the panwith butter. Sprinkle the Nilla wafer crumbs over the bottom of the pan, coating evenly. Place a clean dish cloth in the bottom of a roasting pan, and place the cake pan on top. Start a kettle of water boiling. Meanwhile, beat the cream cheese in a bowl until smooth (I’d recommend using an electric mixer if you have one, but if you don’t just work it hard with a wooden spoon). Gradually add the sugar and continue to beat until the sugar dissolves. Add the eggs one at a time, beating until you have them fully incorporated, making sure to scrape down the sides of the bowl. Add the zest and vanilla and beat until just incorporated. Fold in the cream and sour cream until the mixture is smooth and evenly incorporated. Pour the batter into the prepared springform pan. Set the roasting pan on the oven rack and pour just enough boiling water to come about halfway up the side of the springform pan. Bake for about 55 to 60 minutes, or until the perimeter is set but the center still juggles when tapped. Turn off the heat and leave the oven door ajar for another hour. Remove the springform pan from the water bath and set on a wire rack to cool to room temperature. Cover then refrigerate until chilled, at least 4 hours. Serve cold.